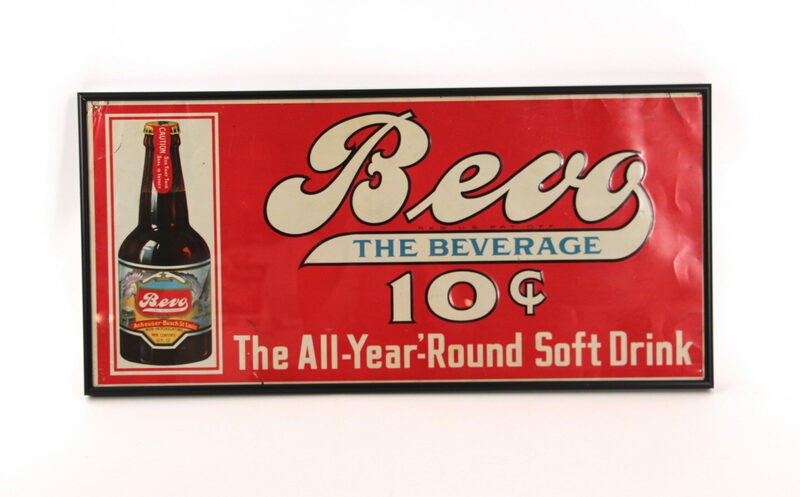 This tin Bevo Beverage sign was produced during Prohibition when Anheuser-Busch made Bevo their number one selling beer alternative, helping to keep the brewery afloat during the dark days of Prohibition. This particular Bevo sign also comes in an alternative style where the 10 cent denomination is missing from the advertisement. The Bevo brand continued being manufactured well into the 1930’s by Anheuser-Busch. Featured is an excellent porcelain stoneware syrup dispenser from the Grape Smash Soda. The dispenser has a slogan “It’s Delicious” on it. This dispenser would have been used in a soda fountain or pharmacy with a soda fountain around 1915. Featured here is a gorgeous ceramic root beer dispenser from the Hire’s Root Beer Brand out of Philadelphia, PA. This dispenser features the popular Hire’s Boy image on it, with the denotation the soda “Is luscious and pure”. Circa 1900. Tin Over Cardboard style Canoe Club Beverage Soda Sign E. DuCharme Bottling Works, Aldenville, MA. 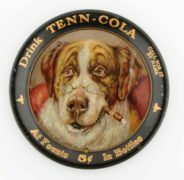 Tenn-Cola Tip Tray for their soda brand. This one says "At Founts" & "In Bottles" with a 5 cent designation. The tray features a Saint Bernard dog with a cigar. 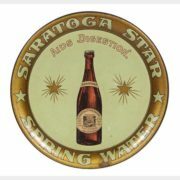 Photographed here is a beautiful tin tip tray from the Saratoga Springs N.Y. area for their Star brand of spring water. Pictured is a beautiful 1904 Hood’s Sarsaparilla Lithographic calendar for their famous drink. Hood’s was based in Lowell, MA and the company produced calendars on a yearly basis. Featured is one of the prettiest Coke advertising pieces I have seen with a stunning gold self-framed tin edge on this sign. 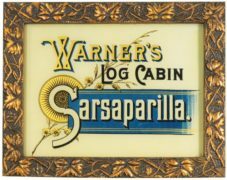 Featured is an incredible gilt edged glass sign advertising the well known Warner's Log Cabin Sarsparilla brand of soda. The brand of medicinal blood purifier was sold by the H.H. Warner Company based in Rochester, N.Y.
MUELLER-KELLER CO., ST. JOSEPH, MO. ROSARY ROOT BEER SYRUP DISPENSER. 5 Cts. Circa 1920. Pictured is a gorgeous pottery syrup dispenser from the Mueller Keller Company in Saint Joseph, Missouri for their invigorating and healthful Rosary Root Beer drink. Circa 1920. Featured is a nice cardboard sign from the Howdy Orange Drink Soda brand, which says “Don’t say Orange, Say Howdy” as their slogan. Circa 1930’s. Drink Golden Orangeade Drink, Tin Sign. J. Hungersford Smith Co., Jersey City, N. J. 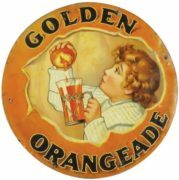 Here is a very unusual round tin sign from the Golden Orangeade brand of soda, circa 1900. This drink was made by the J. Hungersford Smith Company of Jersey City, New Jersey. Featured is a tin sign from the Dr. Pepper Soda Company with a gorgeous woman on it. The sign says Dr. Pepper will give you "Vim, Vigor, Vitality" and the drink is "Free From Caffeine".